When the Seattle Mariners drafted shortstop Brad Miller out of Clemson they knew exactly the type of person and player they were getting. Through his college years, Miller had earned the reputation of having a strong work ethic and being a team leader on and off the field. Scouts may love players tools but when you combine them with the characteristics that Miller has displayed you have the potential to have a special player and potential future star. Height: 6′ 2″, Weight: 185 lb. Favorite Player: Ken Griffey Jr. Prior to attending Clemson or being a member of the team USA baseball program, Miller starred at Olympia High School in Florida. After an incredible junior season in which he hit .420 and got on base at a .560 clip, Miller was named Olympias MVP and began to be on the radar of some of top college programs as well as teams around the major leagues. Miller was rated by Perfect Game as the #17 prospect in Florida before the 2008 draft. At that point in time, Miller had committed to playing at Clemson which caused many teams to shy away from the shortstop. The Texas Rangers selected Miller in the 39th round with the hopes that they could steal him away from the Tigers program. Miller stayed committed to Clemson and enrolled at the University the following year. As a freshman at Clemson, Miller saw action right away and became the first freshman to start every game since the 2005 season. Playing almost exclusively at shortstop, Miller showed his patience at the plate walking a (freshman record) 53 times on the year. At the plate, Miller found himself on base .405 of the time while batting .273 with three home runs and 36 RBI’s. With a strong freshman year behind him, Miller was set to improve his game and his numbers during his sophomore campaign. A trademark of his college career continued as he displayed an uncanny patience at the plate. Miller led the Tigers with a .357 batting average and also walked 50 times on the season improving his on base percentage to .463. He also saw an increase in power at the plate, sending eight balls out of the park on the season and adding an additional 23 extra base hits. During the offseason, Miller had the opportunity to represent the USA National Team and continued his hot hitting. In his 34 at bats, Miller hit a team best .441 and also walked an additional six times for an astounding on base percentage of .525. Miller’s leadership in the field and at the plate helped Team USA to a silver medal in Tokyo, Japan. After completing two full seasons at Clemson and his experience with Team USA, Baseball America ranked Miller as the #3 prospect in the entire ACC conference heading into the 2011 college season. As a junior, Miller’s season was much like his first two seasons as a member of the Clemson baseball team. The left-handed hitting shortstop continued to improve on parts of his game that where already churning at a high level. Miller hit for a .395 batting average his junior season and once again showed his knack for taking a walk. Miller’s on base percentage continued to rise and as a junior he got on base .498 percent of the time. As the 2011 season came to a close, Miller was awarded the 2011 ACC Player Of The Year Award and also received the Brooks Wallace Shortstop-of-the-Year Award. Producing the numbers that Miller did throughout his college career it was only a matter of when and who would select him in the 2011 MLB draft. It did not take long for Miller to hear his name either as the Seattle Mariners selected him in the second round. Miller did not sign immediately with the Mariners and negotiations came down to the final days of the signing period. Along with first round draft pick Danny Hultzen, Miller was inked to a contract on the final day and the two were introduced as members of the Mariners organization at a press conference. Soon after the announcement, Miller found himself finishing out the final weeks of the minor league season with the Clinton LumberKings. 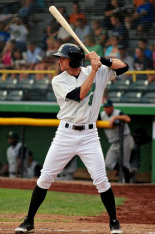 Playing in 14 games for the LumberKings, Miller managed to accumulate 53 at bats and continued his trend of hot hitting. Miller hit for a .415 average and while he only walked four times he still finished the season with an on base percentage of .458. This brief taste of the professional game proved that Miller was up to the task and ready for the challenges the 2012 season would hold. The Mariners aggressively pushed Miller up a level to start the season. Miller started the 2012 season with the High Desert Mavericks in the hitter friendly California League. Playing in 97 games for the Mavericks the league did indeed prove friendly to the offensive minded Miller. During his stint with the Mavericks, Miller hit .339 and hit a career high 11 home runs. He also continued to walk, taking first base 52 times and scoring 89 runs. The Mariners chose to promote Miller up to their AA affiliate in Jackson during the second half of the year to see if Miller could continue to hit at his torrid pace or if it was just a product of the California League. In 40 games with the Jackson Generals, Miller continued to hit, batting .320 on the season while keeping his OBP above .400 mark at .406. He also showed continued power potential hitting 4 additional home runs to give him 15 for the season. During the offseason the Seattle Mariners invited Miller to participate in major league training camp. Miller impressed Mariners management with his hustle, leadership and approach to the game. He played in a total of 20 spring training games and ended up being one of the final training camp cuts. Miller saw action in the spring not only at shortstop but also at second and third base. Although he has not played much at these positions in his career it was a learning experience for Miller and a chance for the Mariners brass to see if he was capable to handle those positions as well as shortstop. Facing the toughest competition he has faced in his career, Miller hit .222 in 45 at bats but also had six extra base hits including a home run. As spring training came to a close the Mariners sent Miller back to the Jackson Generals in the Southern League to start the 2013 season. Over the course of the first 19 games of the year Miller his hitting just under .300 at .288. He has shown some early power hitting three home runs for the Generals and has been a middle of the order presence. Miller has continued to play primarily at shortstop but has seen action at second (3 games) and third (2 games) early on in the 2013 season. With the weather on the east coast being well below average temps one can assume Miller will continue to heat up as spring turns to summer. We will continue to follow Brad’s progress all season long as he continues chasing his way to the majors in the Mariners organization. Be sure to follow Brad on twitter @SergioMillar and follow us at @CTD_Sypien as we will provide updates on Brad all season long. 1.You where drafted twice. Once after high school and then once in college. What was each experience like for you. What where you doing when you found out you were selected? Both times were awesome! I was not expecting anything out of high school so I was actually playing catch in my front yard with my best friend when the team called me and said congrats. It was awesome! Then in college I was actually driving to meet up with my parents at their hotel. I kept refreshing the MLB draft page on my phone and right before it happened it froze and I got blown up with text messages from friends. I’ll never forget either time. 2. Before starting your professional career you had a chance to represent you country by playing for Team USA. What was that whole experience like for you? It was one of the best experiences of my life! Just getting the opportunity to represent our country was amazing and then the people and coaches I met really topped off the whole experience. Getting to travel across the globe, being on the road all summer really helped me grow up a little bit too. I still talk to all the guys from those teams and run into them on the field quite a bit! 3. Since turning pro you have had a lot of success at the plate. Tell us a little bit about your approach with the bat? My plan is just to be aggressive. Easier said than done but I just want to be on the attack. I feel when you are more aggressive, you start to pick out your pitches and have conviction when you swing. So that’s the plan is just to keep getting better at really attacking the zone every time. 4. This season was your first experience at big league camp in spring training. What did you take away from it and was there any particular player or players you learned a lot from? I took away more than I would’ve thought coming into it. It was an amazing experience just to be in the clubhouse and 1st hand see how those guys prepare themselves and go about their business every day. Every guy was really helpful and welcoming and I just tried to learn from every one there whether it be asking questions or just watching them go about their business. 5. In your professional career you have played shortstop but in spring training you got a taste some other infield positions. Is it difficult to just pick up a new position like that? Do you expect to get action all around the infield diamond in 2013? It was pretty cool to get some action at 3rd base there at the end of camp. I actually have never really played there but it was a lot of fun to work there and try to make some plays over there. I think it’s hard anywhere and you just want to make the most of any opportunity they give you. So I was excited to be on the field and anywhere I play I want to help my pitcher out. 6. Opening Day – What does it mean to you? Wow the start of a new adventure. (Haha) I think it’s great everyone is ready to go and play again after the winter. Some guys have a longer break than others but I think it means we get to go into battle for the first time with this group of guys. 7. In watching some of your early season games on Milb.tv the opposing announcers seem surprised to notice that you bat without batting gloves. How rare is these days for a player like yourself not to wear batting gloves and why do you prefer to bat that way? (Haha) I get asked that quite a bit. Even some guys on the other teams make comments about it but honestly that’s just what I’ve always done. I feel comfortable without them and I’ve tried to wear them in college for a little bit but it just doesn’t feel right. My hands are all beat up but I just have a better feel for the bat. I’ve seen a good amount of guys do it! I know Kendrys Morales in spring training would go on and off so it’s kind of cool when you see other guys that don’t use them. 1. Favorite Player Growing Up? Easily Ken Griffey Jr. Huge Griffey fan growing up and our little league team was always the Mariners. 2. Whats your favorite thing to do to keep yourself occupied on long bus trips? I actually just got an MLB.TV subscription so watching the Mariners games has been it. Or whatever the latest game is that we all play on the bus! I can’t sleep though. 3. Who is the biggest prankster you have come across in your time with the Mariners? Haha definitely Jack Marder. You always have to be on your toes because he has some new game he’s always playing to get you to slip up. He’s good real good! A special thanks to Brad Miller for taking some time out of his day during the season to answer some questions for us. We look forward to following him all season long and into the future. Please give Brad a follow on twitter @SergioMillar and like us on Facebook and follow us on twitter @CTD_Sypien as we continue to feature and follow all of our featured players as they chase their way to the major leagues. 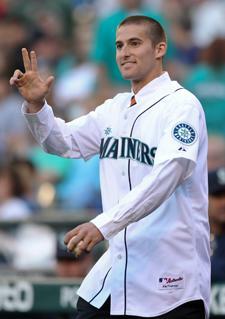 Congratulations to Brad and his fast paced baseball career with the Mariners. Got a chance to meet his family during that season with Team USA that year , as Cody Wheeler was part of that team the same year. What a great family – Good Luck Brad.